Between the town of Delburne and the Saskatchewan border, the river cut into the sediments with a vengeance. Approaching from the surrounding prairies, the traveler is not conscious of the impending scene to the revealed. It comes quickly and with a huge sense of awe. 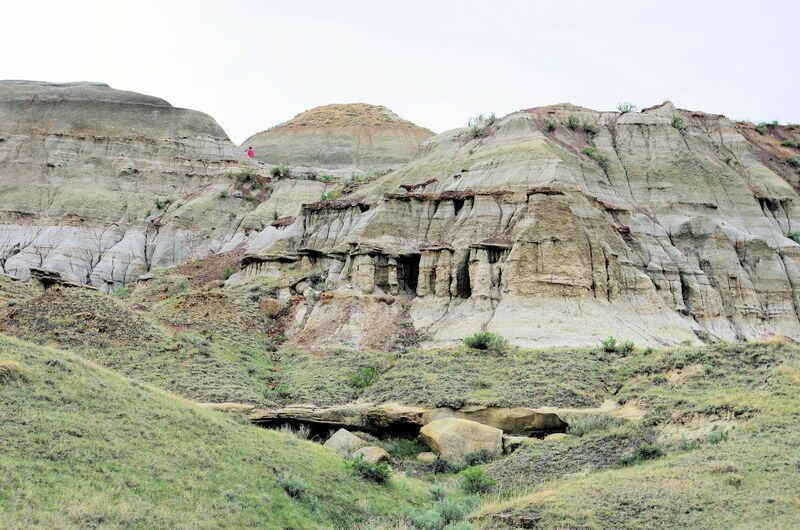 The Red Deer River Badlands open to the visitor like magic, as though a blindfold is suddenly removed to reveal features from another world, another time, and another place. Stark landscapes punctuated by deep clefts and ravines create an otherworldly feeling for those who explore. Truly, it is one of those places that have to be seen to be believed. And what a treasure the river uncovered! One of the world’s premier beds of cretaceous dinosaurs bones stretches for 200 kilometres along the river’s valley. Complete and nearly complete specimens from here are represented in museums throughout the world, and one of the greatest museums is at Drumheller, the Royal Tyrell Museum of Paleontology. It is a research facility renowned worldwide for the study of dinosaurs and the creatures that lived beside them. Even the casual tourist can have the thrill of finding a dinosaur bone lying just where the incessant erosion left it. And for a few lucky ones, there is the chance of an once-in-a-lifetime thrill, winning the paleontological lottery of finding a large piece of bone or even a complete skeleton. 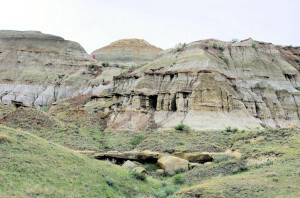 Dinosaur Provincial Park. Copyright 2014 W. Heinsen. Albertosaurus, camptosaurus, edmontosaurus, stegosaurus, stenonychosaurus, and tyrannosaurus rex, they were all here. And in a way, they still are. 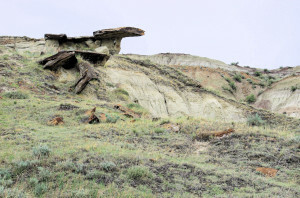 At Dinosaur Provincial Park, visitors can see specimens still resting in the rocks where they were encased over 65 million years ago. At the Tyrell Museum, they stare down at you from the dioramas showing them and their lives. And the valley is not just home to creatures from the past. Some areas have become havens for bird watchers. Ranchers use parts of the rich valley floor to raise the beef cattle for which Alberta is so famous. 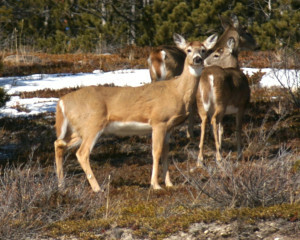 East of Red Deer, a mollusk layer on the riverbank contains the remains of many extinct fish species, turtles, campsosaurs, crocodiles, mammals including primates, and plant material. This horizon is on a near-vertical bank approximately 25 metres in height. Also present above this horizon is a layer of ash from Mount Mazima, the Oregon volcano responsible for the formation of Crater Lake 6600 years ago. 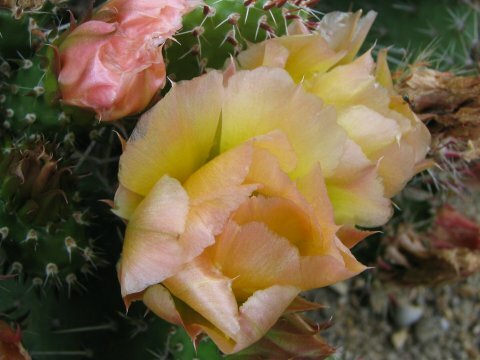 Prickly Pear (Opunita fragils) is a common plant in the badlands. Photo copyright 2010 W. Heinsen.